We supply any props that are directly associated with the story, such as wills, maps, fake weapons etc. When guests are playing suspects we can often supply hand props etc that can help with establishing their character. 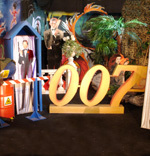 We are also happy to supply themed items such as place cards and menus to dress tables etc if required. Many of our stories are selected or adapted so that the venue does not need any additional decoration, as fitting out a large venue to suit a particular theme can be a time-consuming undertaking. We have a few smaller items of "set-dressing" which we can supply for some of our themes, but if you require something more elaborate, we can assist in sourcing what you need. For larger props and scenery we usually use Themes of Glastonbury, Somerset, but other suppliers may be preferable in other parts of the country.